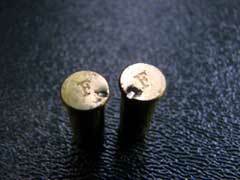 I love the .22 Long Rifle cartridge. It is, and has long been, my favorite cartridge. 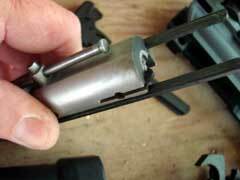 I can do at least ninety percent of what I need to do with a rifle chambered for that dandy little cartridge. 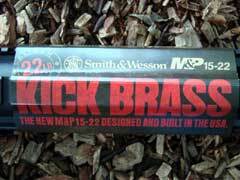 It is an excellent cartridge for small game, and can also be used to harvest turkey and deer, if necessary. I am glad that I have other, more powerful rifles at my disposal, but if I had to pare down to just one rifle, it would be chambered for the .22 Long Rifle cartridge. That answer usually disappoints people who ask me the “If you could only have one” question, which is, by the way, a rather rude question, akin to asking a man to choose his favorite child or something. I suppose that most folks expect me to choose something larger, and I do love big-bore rifles, but none are quite as versatile as a good twenty-two. It is distasteful to think that I would ever have only one rifle, but if it came down to it, it would have to be a twenty-two. Rifles chambered for that cartridge have been around for well over a century, and the .22 Long Rifle is the most popular cartridge in the world. With the AR-15 being one of the most popular rifles in the world, it stands to reason that an AR chambered for the .22 Long Rifle cartridge would be on most everyone’s "gotta have one" list, and for that reason, conversions have been quite popular for several years now, with better the ones hitting the market in the last couple of years. 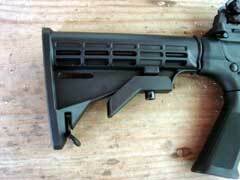 The Tactical Solutions unit is an excellent conversion, and it will work with most any AR-15 lower. Also, dedicated .22 Long Rifle AR style rifles have recently been introduced, with both Colt (Umarex) and Smith & Wesson introducing rifles at the 2009 SHOT Show. I reviewed the Colt unit about a month ago, and have been anxiously awaiting the arrival of the S&W, which is the subject of this piece. Now, before the emails start rolling in asking me to choose, forget it. I do not do that. I report on the reliability, handling, accuracy, functioning, etc., and the choice is left up to the individual, based upon his or her preferences. 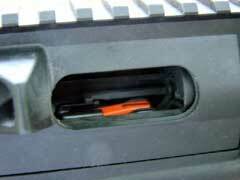 Besides, if I were able make such a choice, I would not need multiple gun safes. 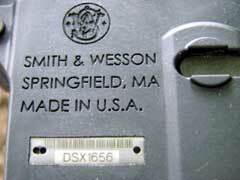 However, to relieve the suspense, Smith & Wesson definitely got this one right. Not built necessarily to replicate the exact feel of an AR-15 or M4 carbine, the S&W M&P 15-22 has operating controls that are identical to those, and would be a superb understudy to those weapons, but promoting the M&P 15-22 as nothing more than a little brother to an AR would be selling the weapon short. Weighing in on my scale at just five and one-quarter pounds with an empty magazine in place, the S&W has a delightful balance and feel, lighter than its centerfire big brother. The sixteen-inch barrel measures .670 inch its entire length, has no bayonet lug, and is not contoured to affix a grenade launcher. 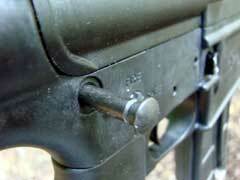 It has no muzzle brake nor any other appendage. 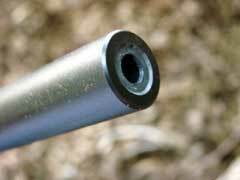 I would prefer that the barrel was threaded to accept a sound suppressor, but that is easily corrected for those of us who like to attach such things to reduce the weapon’s sound signature. 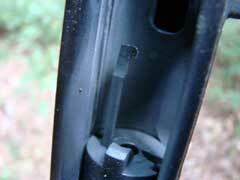 The barrel is slender, straight, and built for accuracy. 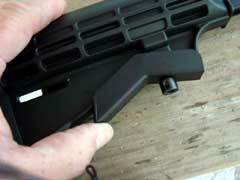 Both the upper and lower receiver halves on the M&P 15-22 are made from reinforced polymer. 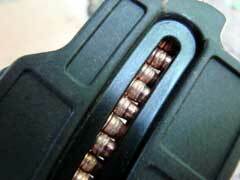 The bolt rides smoothly upon steel rails, and the twenty-five round magazine is very well-designed. 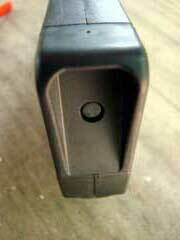 There is also a ten-round version available where magazine capacity is limited by law. 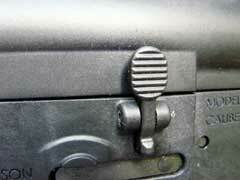 The magazine follower has buttons on both sides to assist in easily loading the magazine. That is very important, and a welcome feature. 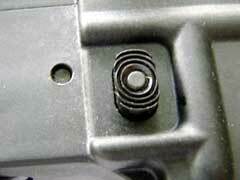 The magazine also has an activator for the bolt hold-open, to lock the bolt to the rear on an empty magazine. 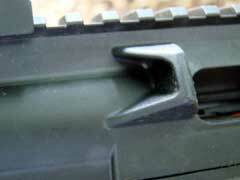 The bolt release works identically to a centerfire AR, as does the charging handle. 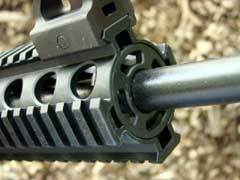 The hammer is a full-sized AR unit, which really gives the firing pin a healthy smack. 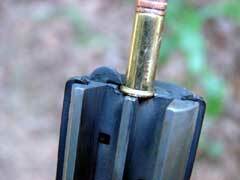 There were absolutely no misfires with any ammo tested, as every cartridge rim received a robust dent from the firing pin. 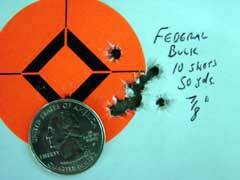 This is a weakness with some rimfire AR rifles and conversions, but not with this S&W. Likewise, the extractor and ejector are also well-designed. There were no failures to feed, fire, extract, or eject any cartridge tested. 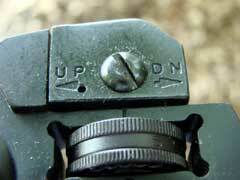 No break-in period, no special cleaning, no fiddling around to find the rifle’s favorite ammunition. I just loaded it, fired it, and never cleaned it or added any lubrication. I would have been well-pleased if the rifle had stuttered a bit when new, and settled down later, but this little jewel was one hundred percent reliable, right out of the box. A lot of my initial shooting was done using the excellent, fully adjustable A2 style aperture sights, which are easily removable, but for accuracy testing, I mounted a Leupold Mark 4 scope atop the upper receiver’s integral Picatinny rail. 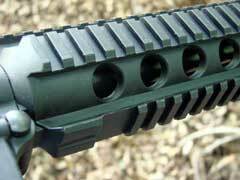 Speaking of rail, there is plenty of it on the M&P 15-22 to make anyone happy. The quad-rail handguard has enough territory to easily mount optical sights, lasers, flashlights, sling attachments, or whatever else one desires. Back to the accuracy testing. 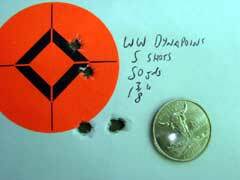 I tried every type of .22 Long Rifle ammo that I had available, and accuracy was very good with all tested. Thankfully, the rifle performed very well with my favorite brands, which are the bulk Federal and Winchester hollowpoints that are available for about two and one-half cents per pop. 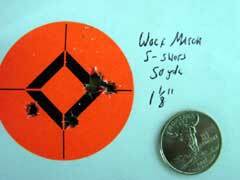 PMC Match turned in the best groups, and would shoot into the same hole at fifty yards, if I could do my part, but for small game hunting and general plinking, I prefer the hollowpoints, and they were almost as accurate. 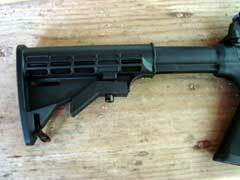 At any rate, this is a match-accurate little carbine, and would make a dandy squirrel rifle. 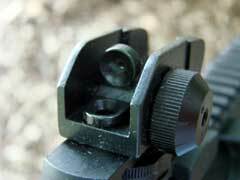 It would also be ideal for competitive matches that use semi-automatic rimfire rifles. 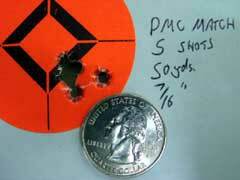 After the accuracy testing was done, I started clipping weeds on the range with the little M&P carbine. It worked perfectly, and is much more fun to operate than a weed eater. 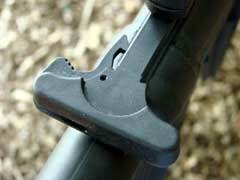 The trigger pull measured five and one-quarter pounds on the test rifle, which is better than on most AR type rifles. 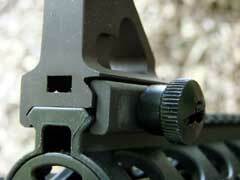 I prefer a bit lighter weight on my rimfires, but that is easily corrected by anyone who is familiar with AR triggers. Also, while not my first choice for self defense, this little carbine would certainly be able to repel anyone who might happen to kick in the back door at night. 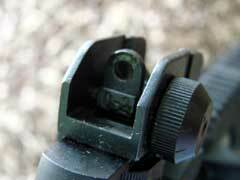 A face-full of hollowpoints is a good deterrent, and the M&P 15-22 spits them out at a rate of about five per second. I suspect that many buyers of the 15-22 will do so as an understudy to their centerfire AR rifles, as ammo costs much, much less to feed this little rimfire. 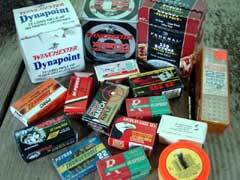 You can get a box of 550 .22 Long Rifle cartridges for about thirteen bucks. 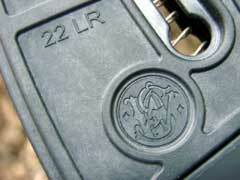 The same amount of quality 5.56mm or .223 Remington will cost about $250. The savings add up quickly. 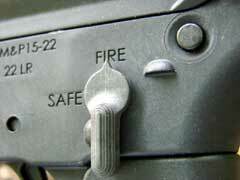 However, even if you do not own an AR-15 style rifle, the M&P 15-22 is an excellent choice. 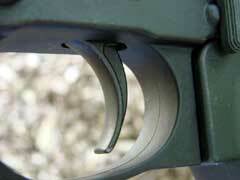 The six-position buttstock adjusts to fit shooters of all sizes. I often let my five-year-old grandson shoot this type of rifle, and the light recoil and adjustable buttstock, combined with the light weight of this S&W makes it an ideal trainer for youngsters, allowing the rifle to easily grow with the child. Ethan also likes the fact that this M&P 15-22 is very similar to the rifle that his Dad uses at work on the other side of the world. 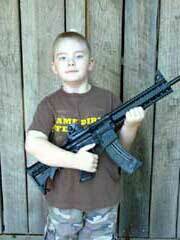 Also, when the child is grown, he will already know how to operate our country’s main fighting rifle. In the mean time, the ease of use, lightweight, and accuracy of the M&P 15-22 provides these young shooters with hours of affordable rifle shooting. For those of us who are already grown up, the M&P 15-22 is a very practical, accurate, and reliable rimfire hunting, plinking, and training rifle. A law enforcement agency could pay for one of these rifles in just a couple of days of training one officer on an AR-15 with the savings over the price of buying centerfire ammo. 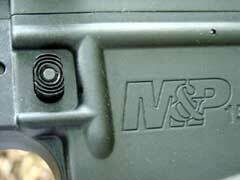 Another very nice feature of the M&P 15-22 is the price. 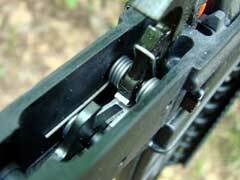 As of this writing, it lists for a buck under $500, and the rifles are shipping to distributors and dealers now. 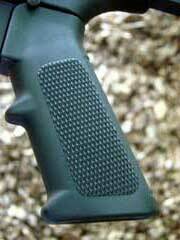 A version with a ten-round magazine and fixed buttstock will be available soon, for those who live in jurisdictions where such features are required. 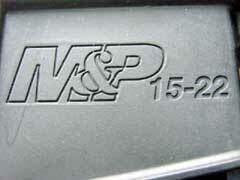 The Smith & Wesson M&P 15-22 is light, handy, reliable, and accurate. It is built right, and built in the USA. 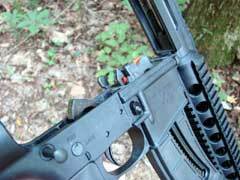 I am buying this one, and recommend this little carbine without hesitation. Check out the M&P 15-22 online at www.smith-wesson.com. 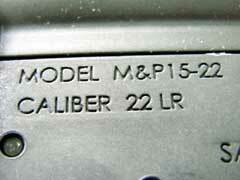 To order the M&P 15-22 online, go to www.galleryofguns.com. 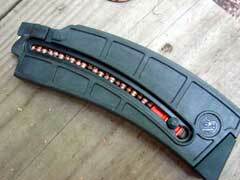 Gun is supplied with a 25-round magazine, but is also available with a 10-round magazine where required by law. 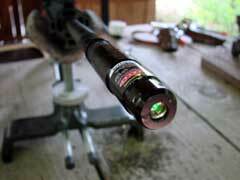 Jeff boresighted the carbine with a LaserLyte Kryptonyte Green Laser unit. 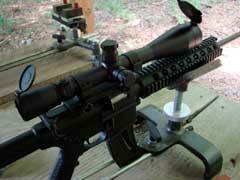 The M&P 15-22 was 100% reliable and very accurate with a variety of ammunition. 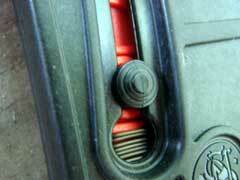 Bolt locks into the open position on an empty magazine. 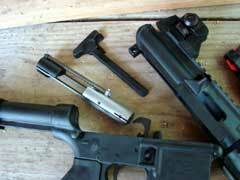 Disassembly for cleaning is simple, requires no tools, and will be familiar to those acquainted with AR-15 style rifles. 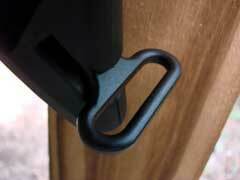 Bolt glides smoothly on steel rails. 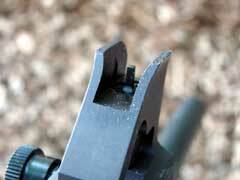 Firing pin gives a good, hard hit on the cartridge rim for positive ignition.